A small town in the picturesque state of Odisha, Konark is famed all across the globe for its magnificent centuries old Sun Temple. Also dubbed as Black Pagoda, constructed during the rule of King Narasimhadeva, the temple was declared a UNESCO world heritage site in 1984.The place will let you experience a completely unique vacation by making your acquaintance with quite a hundred centuries old traces, splendid tranquility and superb Indian rituals. 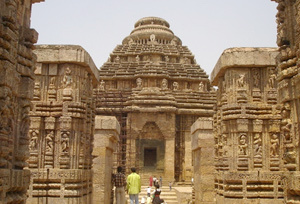 It is no surprise that Konark has its own charm and uniqueness that makes tourists fall in love in with it completely. The stupendous monuments of this beautiful place reflect the epitome of Oriyan structural design. Famous Konark Dance Festival gets praises from all over, where amazing classical dance performances bestow a delight to visitors' eyes. The appeals don't end; there is so much more to scout making it one of the most sought after destinations of India. Konark is a blend of two terms, Kona and Arka namely Corner and sun, when they are joined together, signifies the sun of the corner. While going through the leaf of Konark history, you will come to know that this tiny locale was among the ancient sites involved in sun worshipping. According to myths, its renowned Sun Temple devoted to Sun God materialized after Lord Krishna cursed his own son Samba with leprosy. When Lord couldn't bear to see him in this condition, he asked Samba to start offering prayers to Sun God as only he could heal his disease and bring end to the curse. The boy nodded to the advice and decided to spend all his time worshipping God Surya. He had done severe penance for almost 12 years impressing Sun God by his determination who thus blessed him with good health. Therefore, Samba constructed the Sun Temple as a sign of respect to the Sun God. ASI Museum: Positioned in the exterior of the sun temple, the ASI Museum puts on view a few beautiful models of old centuries Oriyan Structural Design. It comprises of four galleries exhibiting 260 different remains picked up from the Sun Temple. The museum remains open from 10 in the morning till 5 in the evening on all days except for Friday. Sun Temple: Erected by Narasimha Deva during the 13th century, Sun Temple is amongst the most popular testimonials of India. The temple's grand architecture and different themes draw the attention of the onlookers. Konark Beach: A splendid beach where travelers can relish the tranquility of a pilgrimage center is none other than the renowned Konark Beach. During the festival of Magha Saptami, the devotees take a dip in the holy water and a glance at the rising Sun. Indeed, the place tenders a pleasant and unruffled ambience of relaxation. By Air: The closest airport to reach Konark is Bhubaneswar, which is located at a distance of 40 miles. For further journey, one can take a taxi or a cab to Konark. By Rail: Puri is the nearest railhead to make it to Konark, about 31 km away. The other nearest railway station is at Bhubaneshwar, positioned at a distance of 65 km. 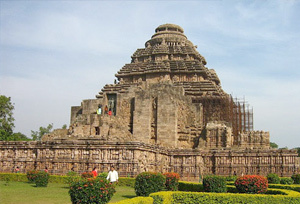 By Road: Konark is connected with all the main cities of India by good motorable roads. Volvo bus services are also available from the major cities in and nearby the state of Orissa.